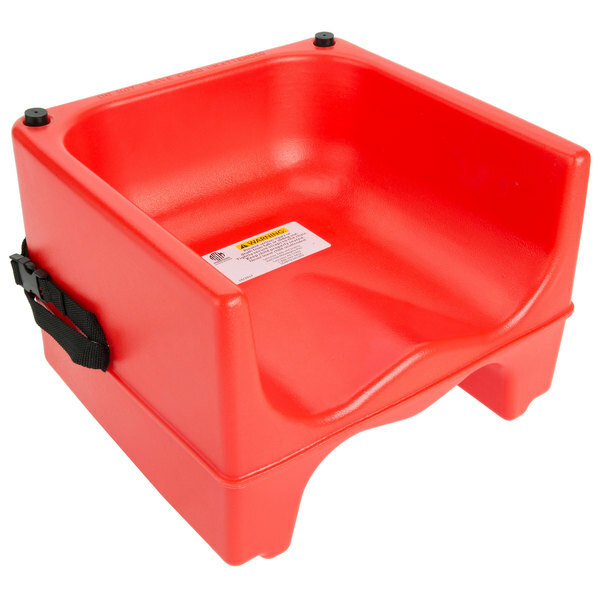 Give your smallest guests a comfortable place to sit with this Lancaster Table & Seating red dual height plastic booster seat! This booster seat features a contoured seat to fit the shape of each child and promote comfort. The textured exterior helps to keep them from slipping around, while the built-in non-skid pads keep the seat securely on chairs. Plus, the dual height allows you to use the same seat for children of varying ages and sizes. This booster seat comes with two straps to keep children safe while they're sitting. The first strap attaches to the back of the chair, while the second strap attaches underneath the chair, helping to keep the seat firmly in place. The included snap clasps ensure quick, simple fastening, too.